Slow Cooker Low-Sugar Barbecued Chicken Lettuce Cups are a delicious option for a light lunch, dinner, or game-day food! These low-sugar barbecued chicken lettuce cups are low-carb, gluten-free, dairy-free, low-glycemic, and South Beach Diet Phase One. Use the Diet-Type Index to find more recipes like this one. 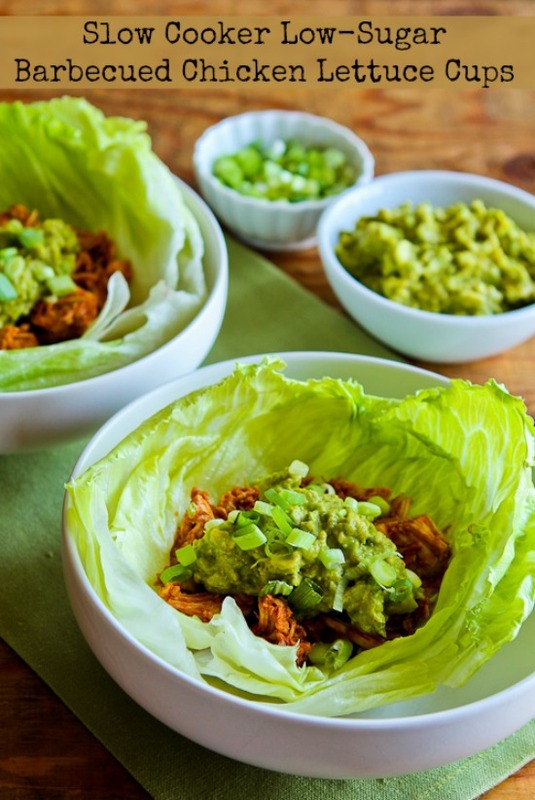 Click here to PIN these Slow Cooker Low-Sugar Chicken Lettuce Cups! I do have a wonderful recipe for Slow Cooker Sriracha-Pineapple Barbecued Chicken on the blog, but I came up with this recipe when I had some of my favorite kids staying at my house and I wanted a barbecued chicken recipe that was less spicy and more kid-friendly. 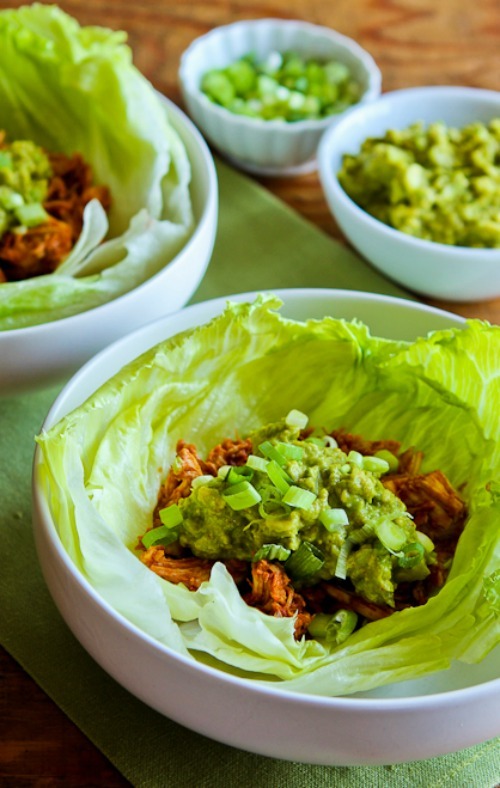 Slow Cooker Low-Sugar Barbecued Chicken Lettuce Cups have the same flavorful sauce as my Slow Cooker Pulled Pork (and you can certainly make these lettuce wraps with pulled pork if you prefer.) I did notice that the chicken cooks much faster, and soaks up the sauce a bit more than the pork. I loved this inside a lettuce wrap, and when the kids were here we used it to make some Quesadillas, which my nephew Mitch gobbled up for lunch one day. And if you’re a lettuce wraps fan like I am, check out some of my other recipes for wraps in this collection of Delicious Low-Carb and Keto Wraps with Lettuce, Collards and Cabbage! I used four boneless, skinless chicken breasts, about 2 1/2 pounds in weight after trimming. Cut each one down the middle lengthwise so it’s easier to pull apart. Mix together the low-sugar ketchup, tomato paste, sweetener of your choice, brown sugar (or more sweetener), apple cider vinegar, mustard, green Tabasco sauce, Worcestershire sauce, and Liquid Smoke to make the barbecue sauce. Spray the slow cooker with olive oil or nonstick spray. Put chicken in a single layer as much as you can and cover with the sauce. Cook on high for 1 hour and then on low for 2-3 hours more. Put the chicken on a cutting board and let it cool while you start the sauce simmering, and when it’s cool enough to handle use two forks to shred the chicken apart. You can use any lettuce you prefer, but I did like the crunch of the iceberg lettuce with this. Cut the core out of a head of lettuce. I used two pieces of lettuce for each one so there would be a generous amount of lettuce to wrap around the saucy chicken. I added a generous dollop of guacamole to each lettuce wrap and finished with a sprinkle of green onions. These low-sugar barbecued chicken lettuce cups are a delicious option for a light lunch, dinner, or game-day food! Trim visible fat and any membranes from chicken breasts, then cut each chicken breast in half lengthwise. Stir together the low-sugar ketchup, tomato paste, sweetener of your choice, brown sugar, apple cider vinegar, mustard, green Tabasco sauce, Worcestershire sauce, and Liquid Smoke to make the barbecue sauce. Spray the slow cooker with olive oil or nonstick spray and layer the chicken in a single layer as much as possible. Pour over the sauce, so all the chicken is covered. When the chicken is done, remove it to a cutting board to cool enough to handle. Put the sauce in a large frying pan and simmer over medium heat until it’s reduced by half, about 6-8 minutes. Use two forks to shred the chicken apart. When the sauce is reduced by half, put the chicken in the frying pan and stir to coat with sauce. You can heat the chicken in the pan for a few minutes if needed. To make lettuce wraps, combine the avocado, lime juice, chile powder and Vege-Sal (or salt) to make the Easy Guacamole, and slice the green onions. Cut out the core of the lettuce with a sharp knife; then peel off two lettuce leaves together to make a “cup” to hold the barbecued chicken. Fill each lettuce “cup” with desired amount of the chicken mixture, top with guacamole and sliced green onions, and devour! If this makes more than you’ll eat at one time I would refrigerate the chicken and lettuce cups separately, but keep one avocado whole to mash up right before you eat the leftovers. The barbequed chicken can also be used for barbecued chicken sandwiches or Quesadillas. I used my Crock-Pot 3-1/2-Quart Slow Cooker for this recipe. It freezes well, so if you have a 6 quart slow cooker you might want to double the recipe and make some for the freezer. I used Stevia in the Raw granulated sweetener for this recipe, but use any sweetener you prefer. This recipe created by Kalyn with inspiration from Slow Cooker Pulled Pork with Low-Sugar Barbecue Sauce and Slow Cooker Sriracha-Pineapple Barbecue Chicken. If you’re making Slow Cooker Low-Sugar Barbecued Chicken Lettuce Cups for a low-carb diet or for the South Beach Diet, it’s important to use the low-sugar ketchup and use all sweetener (no brown sugar). The ketchup will have some sugar even if you use the low-sugar version, but this is still pretty low in carbs. Good catch, it should be tomato paste but I think sauce would work too. There's about 1 1/2 cups of the barbecue sauce, which is thickened and then reduced after it's cooked in the slow cooker. I really don't know how this will work with bottled sauce; I wonder if the sugar will burn in the slow cooker. The recipe says Tomato Sauce, but the directions say Tomato Paste. Which one is right, or does either work? Also, if I'm feeling lazy (which is likely 🙂 and not worried about dieting, do the same instructions apply if I use bottled barbecue sauce? About how much does the sauce recipe make? Thanks Zerrin. Glad you like it! Love those lettuce wraps! It's a great idea to serve chicken in them! Looks definitely perfect for summer! I've been using the slow cooker so much this summer since it's been so hot. I need some new inspiration as I'm making the same things over and over. This chicken could be used for so many things! Thanks for getting my brain turning! Joanne, I was never a fan of bottled barbecue sauce, for that very reason! Lydia, Mitch gobbled up the quesadilla but I doubt he would have eaten the lettuce wrap. And Ethan (the older one) said, "Now you can say on your blog that it's kid approved!" I love the giant lettuce cups (and I'm a huge fan of iceberg lettuce), but I think my grandkids would like those quesadillas a lot. Another great slow cooker dish! I always feel like bbq sauces are a bit too sweet so I'll have to try this!